Metropolitan’s Board of Directors has held its three public meetings to review separate parts of California WaterFix, including white papers on infrastructure, operations and finance and cost allocation. A special board meeting is scheduled for Sept. 26 at which the board may vote on Metropolitan's future investment in California WaterFix. Watch the July 10 committee discussion and staff presentation and read the policy paper and fact sheet on infrastructure. Watch the July 25 committee discussion and staff presentation and read the policy paper and fact sheet on operations. Watch the Aug. 14 committee discussion and staff presentation and read the policy paper and fact sheet on finance and cost allocation. Read about "California WaterFix: Costs, Choices and Critics" in the General Manager's H2outlook blog. Ratepayer Advocate (OPA) issued its report on the cost of California WaterFix to residential households in Los Angeles. The report "finds that under a wide array of cost and water demand possibilities, the WaterFix to upgrade the Sacramento Delta water export system is affordable to Los Angeles households. Specifically, the WaterFix is estimated to cost the median single family resident household an average of $1.73 per month." Find out more about California WaterFix by viewing a suite of online materials and online resources that includes the WaterFix website and toolkit, as well as publications, fact sheets, videos, detailed policy papers, enewsletters (read the latest one) and other material. Metropolitan has lots of tips and resources to help you save water in your yard at its water conservation website, bewaterwise.com. See the latest garden videos that show you water-saving plants and how they look like in a garden. View the September and August videos. 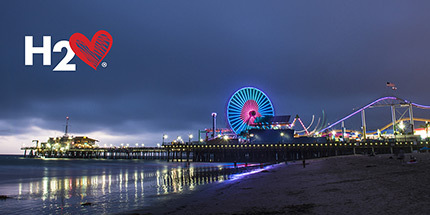 Recently, Metropolitan took over the Pacific Park Ferris wheel at the famous Santa Monica pier as part of its summer H2Love water conservation outreach campaign. View a video of the wheel and photos. Also, Metropolitan and the LA Galaxy’s Brian Rowe helped dedicate the children’s water conservation garden at Ernest E. Debs Regional Park in L.A. View a video of the dedication and photos. In July, Metrpolitan presented LA Galaxy's Title Night game vs. the Vancouver WhiteCaps. View a video of the night. When Fernando Garcia spotted a deer in the water of a steep canal during his routine inspection of the Hinds Pumping Plant on Aug. 16, the plant operator quickly assembled a rescue team. Fashioning a lasso out of the cord from a life preserver, Dane Crawford, Joe Espino and Paul Shamowski (with Erin Monasmith there for moral support) took turns trying to rope the deer. At one point the doe went under water, exhausted from struggling, only to resurface to the teams' great relief. After many attempts, Crawford landed the lasso around a leg. It took nearly an hour to hoist the 200-pound deer out of the 15-foot-steep canal. Once on land, the doe took a few moments to get her bearings and steady her wobbly legs. Then she trotted back to the desert, making the rescuers' day. View pictures from the rescue.